If you are a T.V serial lover then you will have definitely watched the 50 Cent Power Jacket. This serial was released in 2014 and successful at this time also. It has 5 seasons with 48 episodes. The sixth season of “Power” is expected to begin in June/July 2019 as it’s been already commissioned. The internet is passionate about the new up-to-the-minute outerwear and William jackets managed to create a big financial deal to fashion just like the character. Prepare yourself and capture the exact look of 50 Cent in the 6th edition with Brown Shearling Suede Leather Jacket worn by Kanan Stark. In this famous serial James "Ghost" St. Patrick acts as a high-level drug distributor and nightclub owner. He is Angela's ex-boyfriend and Tasha's ex-husband. 50 Cent Shearling Jacket, tells the story of James “Ghost” St. Patrick, a wealthy New York City nightclub proprietor who caters to the metropolis’s elite. The series was produced by Courtney Kemp Agboh, who is also the executive producer and showrunner on the series. In this serial with the growth of the business, ghost wants to build a territory, turn the membership into a fortune 500 business, but there’s simply one problem: Ghost is living a double existence. When he isn't always within the club, he is the kingpin of the maximum rewarding drug network in the city. His wedding, own family and enterprise all come to be unknowingly threatened. In Power 50 Cent leather jacket James wishes to leave the criminal world in order to support his business as a nightclub owner. James who acts as a most important character of that play seems to balance two lives while avoiding police capture. Features never before saw footage from New York-based crime drama with the existence of two worlds, the glamorous nightclub scene, and brutal drug trade. 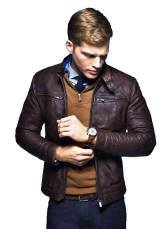 50 Cent leather brown jacket is inspired by the main character of the serial, 50 Cent who act as the fellow drug dealer and Ghost's ex-adviser. The other main characters of include Tommy Egan, Ghost's colleague and all-time friend, seen as a voluntary member of his family. Tasha works as James' wife and illegal collaborator in his drug business. Tariq St. Patrick, James' son desires to join the drug business. He is also the twin brother of Raina. John Mak, a high profile public prosecutor who leads the cases aligned with Ghost. 50 Cent used to wear this jacket in the serial. This jacket has updated design with faux shearling inside which can give your body a moderate temperature even if the temperature goes in negative.